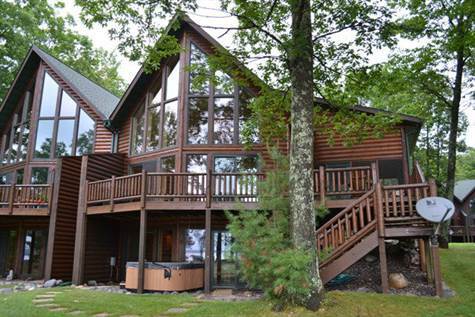 Own the best Whispering Pines condo on Round Lake! High quality chalet with open living areas ,gas stone fireplace, knotty pine accents for a northwoods feel & a bath on each level. There is a large lower level family room with a bar area & walkout to the lake. Wonderful water views from the spacious lakeside deck & just over an acre for plenty of outdoor entertaining area. Convenient to Hayward, many restaurants & outdoor recreational activities.